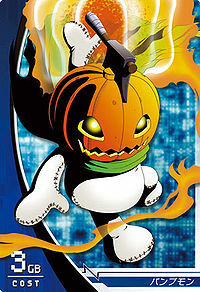 A plush toy Digimon with a pumpkin head. 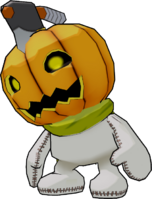 There's an urban legend that says Pumpmon came to be when mutations developed in a computer virus created during the season of the Western holiday of "Halloween". However, though it doesn't inflict any harm at all because it was not a malignant virus, its external appearance belies its possession of powerful offensive ability. As you can tell even from looking at its blank face, a rare expression of emotions is characteristic of Puppet Digimon. 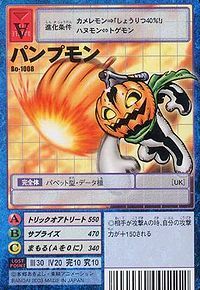 Its Special Move is manifesting a gigantic pumpkin in the air, and then squashing the opponent with it (Trick or Treat). 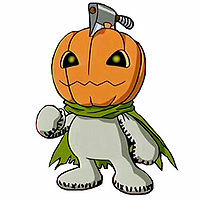 A Plush Toy Digimon that has a surreal head that is said to be a pumpkin with an axe stuck in it. As for its creation, legend says that it came to be when mutations developed in a computer virus created during the season of the Western holiday of "Halloween". Its personality is wrapped in mystery, and as you can tell from looking at its blank face it rarely expresses emotion, so what it's thinking can't be figured out. Because it was never a malignant virus, it rarely inflicts any harm on purpose, but its external appearance belies its possession of a powerful offensive ability. 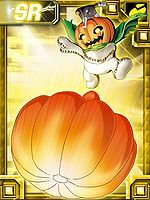 For the Special Move "Trick or Treat" that it uses at this time, it manifests a gigantic pumpkin in the air, and then squashes the opponent with it. | Pump is short for Pumpkin, a type of orange squash associated with Halloween. 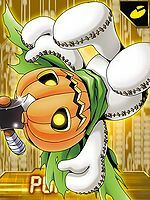 Anime/Manga Digimon Adventure: "Pump and Gottsu are Shibuya-type Digimon"
Trick or Treat  トリックオアトリート Torikku oa Torīto Pumpkinmon Power/Trick or Treat Manifests a gigantic pumpkin in the air to squash the opponent with it afterwards. Tai Atari  たいあたり N/A Tackle Rams the opponent with its belly. Conjures a stream of fire. 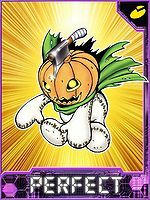 Surprise  おどかす/サプライズ Odokasu/Sapuraizu Pumpkin Squash/Surprise Headbutts the enemy with the ax in its head, surprises them with a shout, or summons an exploding pumpkin. 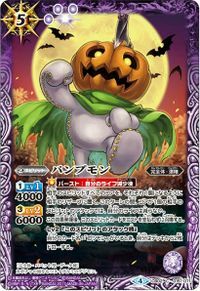 Pumpmon from Digimon Xros Wars. A Pumpmon alongside a Gottsumon were among the members of Vamdemon's army. They were goofing off in the city much to the chagrin of Vamdemon. While protecting Yamato and Takeru, Pumpmon and Gottsumon were killed. 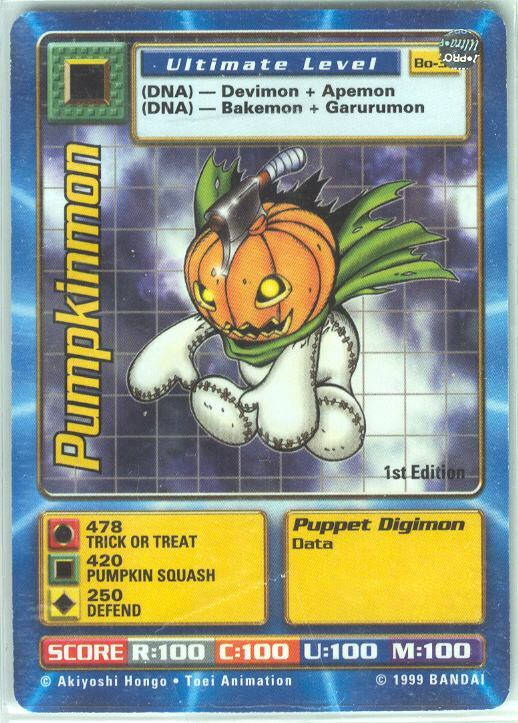 A Pumpmon was among the frozen Digimon in Ice Devimon's collection. A bunch of Pumpmon were seen at the Akiba Market. A bunch of Pumpmon worked for Baromon in the Holy Capital. One even served as Baromon's right-hand man. Several Pumpmon are forced to work for Death Meramon. 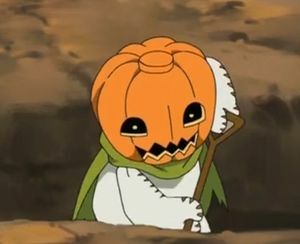 A Pumpmon sells pumpkin pie for Locomon's passengers. 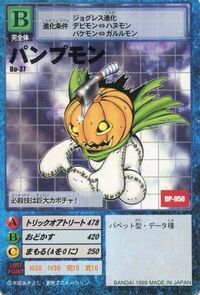 Pumpmon is an obtainable Digimon. Evolves from Togemon (0-5 DP) or Yanmamon (0+ DP) and can evolve to Rosemon (0+ DP). Pumpmon is the partner of Tamada Nozomi. 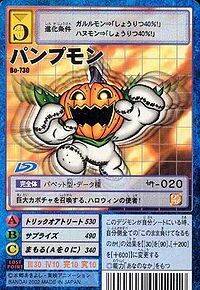 Pumpmon evolves from Hanumon or Garurumon when Jogressed with an Adult Virus 1 or 2 Digimon, Devimon or Bakemon when Jogressed with an Adult Vaccine 1 or 2 Digimon, Meramon when Jogressed with an Adult Data 2 or Perfect Data 2 Digimon, or Wizarmon when Jogressed with an Adult Data 1 or Perfect Data 2 Digimon. 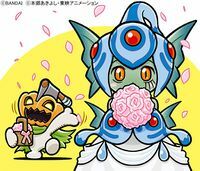 Pumpmon can evolve to Pumpmon when Jogressed with an Adult Data 1 or 2 Digimon, or Boltmon when Jogressed with a Perfect Data 1 Digimon. Evolves from Devidramon, Flare Lizarmon or Togemon. Can evolve to Beelzebumon or Bolgmon. Its Special Move is a giant pumpkin! This emissary of Halloween summons a giant pumpkin! 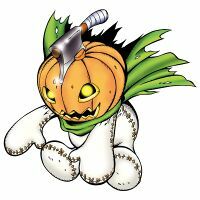 An enthusiastic Digimon resulting from the mutation of a virus that was disseminated on Halloween. While it has a gentle personality and will not start fights out of its own will, its external appearance belies its true abilities. 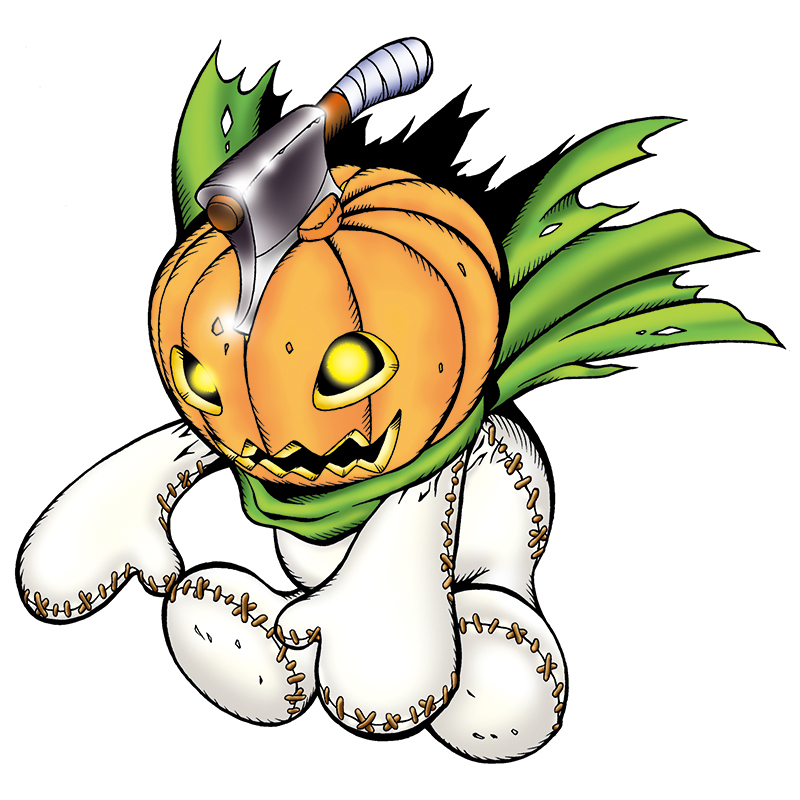 A plush toy Digimon with a pumpkin head.